Friends, it's time for Hanging with Heroes . . . a fun family event centered around real heroes in our community and the make believe heroes we all love. 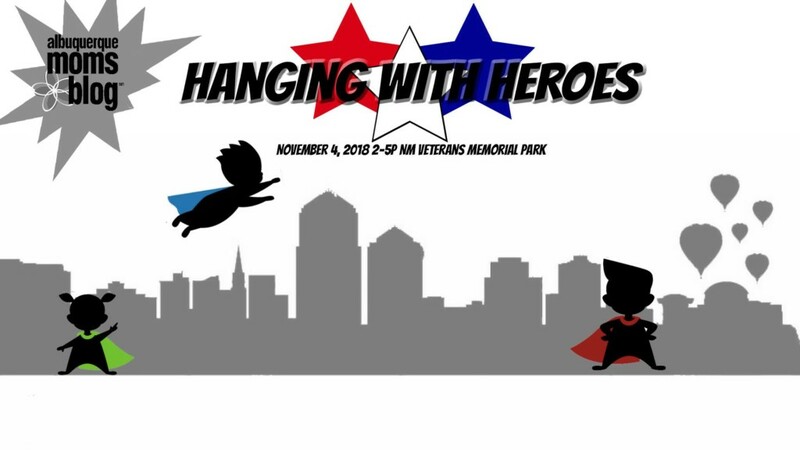 Save the date for Albuquerque Moms Blog's 2018 Hanging with Heroes on Sunday, November 4 from 2-5pm at Veteran's Memorial Park. Just think . . . pizza, face painting, and getting a chance to meet our everyday heroes. Albuquerque police, firefighters, emergency response, and some awesome military personnel will be in attendance (and might let you sit in their cop car). #Yasss. Check out some of the awesome things we have in store for you at Hanging with Heroes! Are you a business who might be interested in partnering with us for Hanging with the Heroes? Please email events@albuquerquemomsblog.com with your business info for more details! WHEN :: Sunday, Nov. 4th from 2 p.m. – 5 p.m.
WHAT :: An afternoon of superhero-themed fun for all families. Tickets are all-inclusive and include all activities, a goody bag for kids, and Dion's pizza and salad. Tickets will go on sale Monday, October 15. *** Our newsletter subscribers will get the opportunity to buy advanced tickets a day early on October 14 for only $5. If you aren't currently a newsletter subscriber, you can sign up here. Ticket Cost is $7 for everyone 2 and older (under 2 is FREE). Your ticket covers food and all activities. Some of vendors may be selling additional items at their tables. No tickets will be sold at the door. When the tickets are sold out, we will be unable to release more. Hold Harmless. By purchasing a ticket, you agree to assume all of the risks associated with your participation. You further agree that Albuquerque Moms Blog shall not be liable and shall be held harmless in any manner for injuries suffered by you and your invitees, guests, or agents. By purchasing a ticket, you understand that your photo may be taken and give permission for Albuquerque Moms Blog to use it on their site, in promotional materials, and/or social media platforms as well as sponsors of ABQMB.